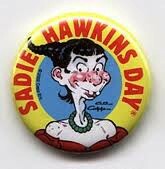 Sadie Hawkins Day approaches. Let’s prepare for it with a trip down Crazy Old Postcard Lane, followed by a brief stop at Why the Day Exists Cafe, and then an overnight stay at Memorable Times We Asked People to Things Blog Post and Hotel Room [slams door, turns lock]. I’m not sure this technically counts as asking, but I got my first boyfriend at camp when Katie the popular girl asked a group of us “who wants to go out with Josh?” and I raised my hand the fastest. Josh wasn’t even in the room, but we’ve been together ever since. Right, Josh? Together in this instance meaning alive at the same time. Elsewhere there is the bourbon-y Sadie Hawkins Sling.